Why not Akismet? The pricing is not reasonable. If it had Amazon like low pay as you go pricing based on usage, I might consider it. In this article, we will see how to integrate Google reCAPTCHA feature to your Rails 5 app. This can be viewed in the html. The secret key is used for server side integration and it must be kept secret. For production, I added the public key and private key to the ~/.profile. No public key specified error. Add the recaptcha gem to Gemfile. to the form. In our case, we will add it to the feedback form. To see this in action go to RubyPlus Contact Page. If you load your form, you will see the CAPTCHA. 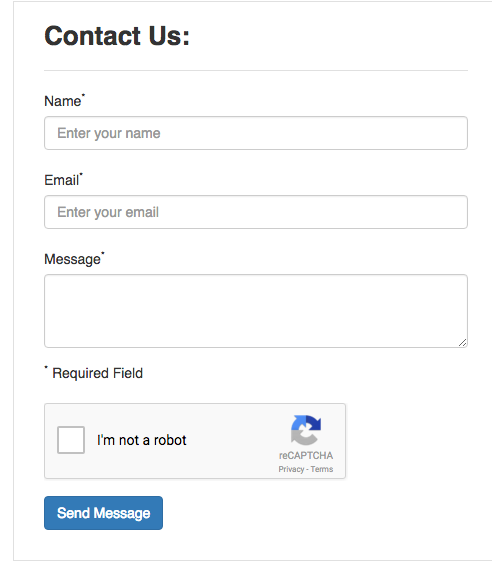 You can add reCAPTCHA to your user registration page. You can also prevent automated scripts from downloading any files repeatedly. This will prevent wasting bandwidth and can save you money on Amazon S3. In this article, you learned how to integrate Google reCAPTCHA with Rails 5 app using recaptcha gem to prevent abuse of your web app.